On TritonWear Insights, you can download either the data from an entire session (workout data for all the athletes at that practice), or from an individual athlete's workout. You must be on a tablet or computer to download the files. To download session data, you must be a coach. Find the workout you'd like to analyze, click the button that says Download CSV, and the session data will download onto your device. Note: if you are on Safari, the workout data will open in the same tab instead of automatically downloading. 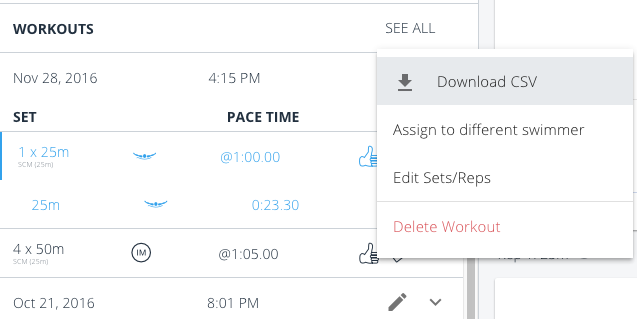 To save it to your computer, right click in the page and choose "Save As"
Downloading data from an individual athlete's workout is available to both athletes and coaches. In the left workout column, beside the workout you'd like to view, click the pencil icon. A menu will open up, and from there choose Download CSV. The session data will download onto your device. Once you have the CSV on your computer, you can open it in other programs (like Microsoft Excel) and analyze the data any way you would like.